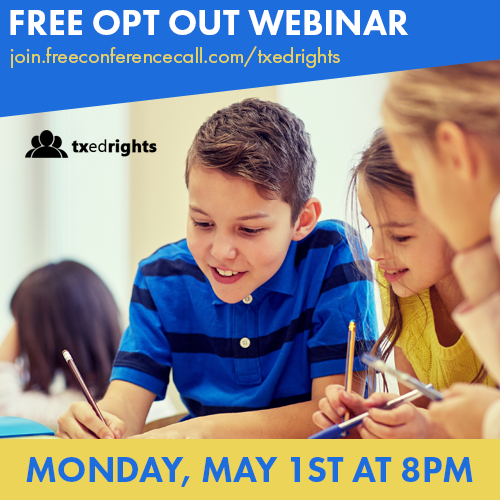 Txedrights is pleased to present our first STAAR Opt Out webinar. Join TPERN Chairman Scott Placek and panelists Caite Brooks, Sarah and Ben Becker and Edy Chamness as they discuss the legalities and practicalities of Opting Out of STAAR. The webinar is free and can be joined by going here: Webinar Link at 8 p.m. on Monday, May 1. Sherry Neeley will be answering questions in the chatroom during the webinar and at the conclusion of the presentation we’ve set aside 20-30 minutes for participants to ask their own questions. I missed this webinar because we have really poor wifi at home. Is there a transcript somewhere? Or was it recorded? Is there an archived video of the webinar available? I have 2 students that will be Seniors next year, well the upcoming school year and I sent in an opt out letter 2 months prior to his and her counselor and never heard from anyone until the week before the test. The main problem that I am having is they switch teachers like towels there, and this messes with the students learning capabilities all by itself. I want them opt out because this is really stressful for them. I need for someone to reach out to Me regarding the measures that I need to take so that they do not have to deal with this next year! Thank you!